WELCOME TO PET IMAGERY! 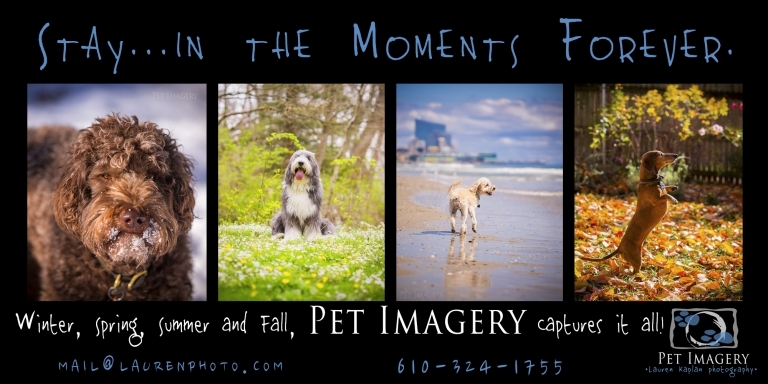 Philadelphia's TOP RATED Pet Photography since 2010! Pet Imagery by Lauren Kaplan specializes in creative pet photography. Photo sessions are held in the comfort of your home or location of choice, allowing your pet's true personality to shine. Lauren's laid-back and relaxed demeanor allow for the sessions to be a fun and memorable experience to share with your pet! There is lots to view here at Pet Imagery! Check out the galleries below, view the BLOG for recent session favorites and of course learn about Pet Imagery's SERVICES, ABOUT ME and read REVIEWS from past clients! Do you have a question about services, scheduling or just want to say “Hey Lauren!”?! The best way to reach her is through mail@laurenphoto.com or by using the contact form below! Look for an e-mail reply within 1 business day! Lauren can also be reached by phone 610-324-1755 during daytime hours M-F.